uniqueName – String. The measure’s unique name. This property will be used as an identifier for the measure inside Flexmonster and as an identifier to remove the measure via API. formula – String. Represents the formula. It can contain the following operators:+, -, *, / and the following functions:isNaN(), !isNaN() (check a full list). Other measures can be addressed using the measure’s unique name and aggregation function, for example sum("Price") or max("Order"). 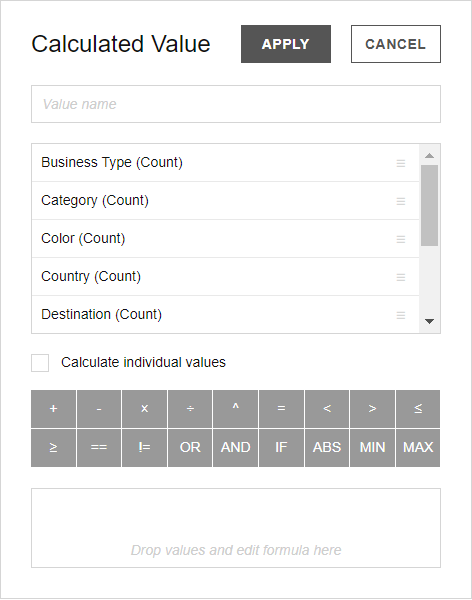 Flexmonster supports the following aggregation functions for CSV, OCSV, and JSON data sources: "sum", "count", "distinctcount", "average", "median", "product", "min", "max", "percent", "percentofcolumn", "percentofrow", "index", "difference", "%difference", "runningtotals", "stdevp", and "stdevs". caption (optional) – String. The measure’s caption. grandTotalCaption (optional) – String. The measure’s grand total caption. active (optional) – Boolean. Indicates whether the measure will be selected for the report (true) or not (false). active: false can be useful if the measure has non-default properties, but should not be selected for the grid or the chart. individual (optional) – Boolean. Defines whether the formula is calculated using raw values (true) or using aggregated values (false). Default value: false. calculateNaN (optional) – Boolean. Defines whether the formula is calculated using NaN values (true) or using null values (false). Default value: true. format (optional) – String. The name of the number formatting that will be applied to the measure. Measure values can be formatted according to the number formatting defined in the report. All available number formattings are stored in the formats array in the report. More information about the number formatting part of the report can be found in the number formatting article. This JSFiddle example shows how to specify the number formatting for your calculated measure. Use Add calculated value in the Field List to add the calculated measure at runtime. Calculated measures can be defined within the report or added via the addCalculatedMeasure() API call. To remove a calculated measure use the removeCalculatedMeasure() API call. removeAllCalculatedMeasures() removes all calculated measures.